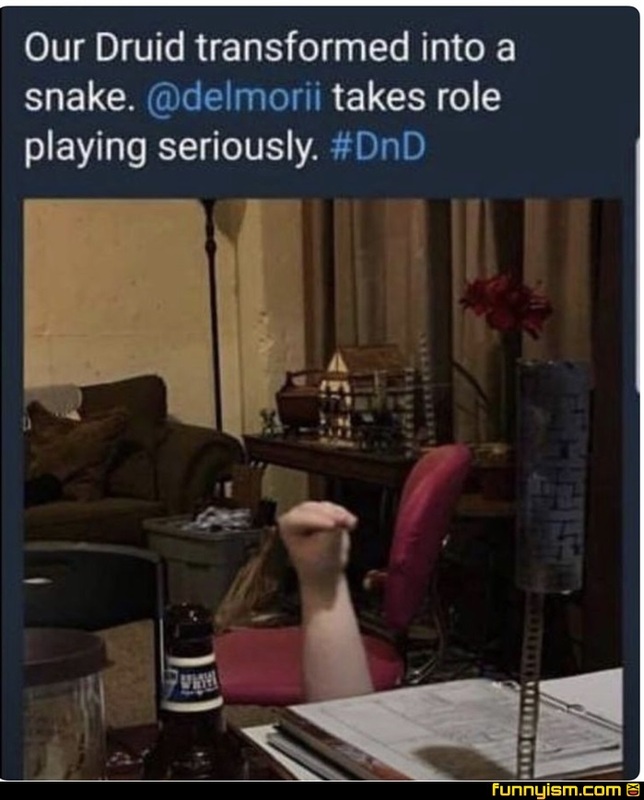 That's pretty good commitment, but I would of slapped my one eyed spitting cobra down on the table. @fettman1138, They said snake, not worm. @Nellybert , Yea, worm from Arrakis maybe. @fettman1138, Scaly, and never been near water to be washed? @Nellybert , More like huge and expecells the water or life. It was good enough for your mother. @fettman1138, She’s old and a widow, gotta get it where she can. I play a paladin with triskadekaphobia, the fear of the number 13, I would get into character by twitching my neck when I rolled a 13. Guess I Pavloved myself a bit too well, because a week ago I passed Thirteenth st and unintentionally twitched.